I was reminded the other day, that I have not posted any messages recently, so I will try to do better. For the past week I have been working on my family tree on the new FamilySearch website. This is one of the websites I provide support for. It is still in an early state of development and has just a few thousand people using it. It won't be available to the general public for another year or two. By then it will be a stable, Web 2.0 genealogy site that is usable without charge. Unlike the present site, familysearch.org you will be able to edit the content in real-time. At least, you will be able to edit material that you contributed. But if you didn't contribute it, you can add the correct information, and choose to have it displayed. Since I was the contributor of most of the things on my family tree, I am in the process of correcting and filling in missing data. In the process I have come across the email address of someone working on the Willerton line and someone working on the Poole line. 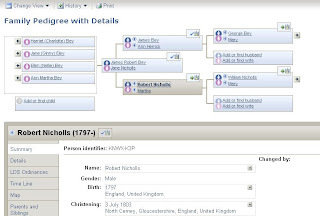 I also discovered the parents of my ancestor Robert Nicholls, of North Cerny, Gloucester, England. It was a nice "bonus". I hope to find others as I work on the family tree. Here is a view from nFS of part of my pedigree. Click the image to see it full-sized.